Audits provide a critical source of data that allows the units to receive regular and consistent feedback about the unit’s success in implementing Fall TIPS and the level of patient engagement. 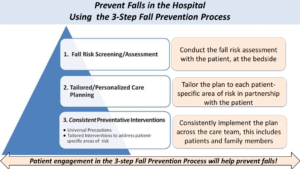 As the Fall TIPS Implementation leader, you will train the Fall TIPS champions to conduct patient audits. Alternatively, you can train the Nurse Director, who can then train the champions. Audits provide the units with regular and consistent feedback about their success in implementing Fall TIPS. Checking in with Nurse Manager/Director about progress, barriers to success, etc. Patient engagement may be a change in the culture of patient care at your hospital. If this is the case, champions should make sure clinical staff are aware of this change and its benefits. Our research has shown that patient engagement is key to Fall TIPS efficacy. We understand that engaging patients is a change in the culture of patient safety. To help your clinical staff integrate routinely engaging patients in their practice, we have developed exercises to practice with. After reviewing the audit instructions with the champions, conduct one or two example audits with patients, while the champion observes. Afterward, discuss the experience with the champion, soliciting their questions and observations. Once the champion has observed a couple of patient audits, have them conduct an audit or two, until they feel comfortable. Afterward, provide constructive feedback, noting what went well in the conversation, and what to work on next time. The peer feedback piece is as important as the audit itself. Here is a link to some Peer Feedback Exercises to help you become comfortable in delivering this kind of feedback. RedCap is the system through which all Fall TIPS audits are submitted. After submission, all audits are assessed and feedback reports are sent back to the units on a monthly basis. Audits are critical to helping the nursing staff see their overall progress within a unit and understand how their outcomes compare to those of other services. You can access the REDCap link for submitting audits by visiting the “Submit an Audit” page. Peer-to-peer feedback is critically important to successful Fall TIPS implementation. As monthly feedback comes in, champions can see areas of success and needed improvement. 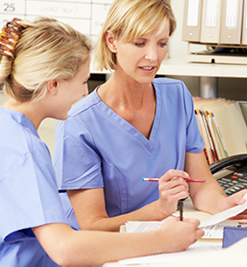 By following up with nurses, champions can address any knowledge gaps or other barriers to Fall TIPS completion and engage nursing staff in brainstorming workarounds or solutions.